Made from a 100% Nitrile rubber compound providing the highest degree of resistance to many industrial chemicals, greases, oils, and animal fats, Niru® Knob-Top Runner® is designed for safety and traction. Its low profile allows carts to roll over the mat with ease. 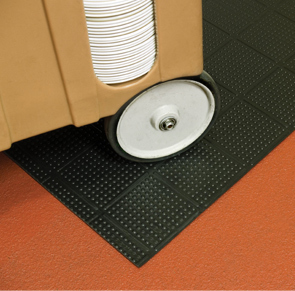 Niru® Knob-Top Runner® is reversible further extending the service life of the mat making it the perfect product for industrial and food service applications where a continuous length of comfort and anti-slip matting is needed. Manufactured with MicroStop™ anti-microbial rubber compound that inhibits the growth of bacteria and fungi to provide a cleaner and healthier work environment. Overall mat thickness is 1/4".